Client side rendering is something that improves the overall user experience when working with XenApp and XenDesktop technologies. However, many folks out there know that client side flash rendering on XenApp/XenDesktop can be a full time job… specially when you introduce Internet Explorer 9 into the environment. The issue below is one of those, when “googling” you find only a few hints towards the same issue but with no solution . After fighting this for a few days, I was able to get things to work on a new XenApp 6.5 with Internet Explorer 9 installed. My thoughts are that It’s only the new Version 2 Flash Legacy that doesn’t support IE9. Flash Redirection allows you to move the processing of most Adobe Flash content from Internet Explorer on the server to LAN- and WAN-connected users’ Windows and Linux devices. This processing includes animations, videos, and applications. By moving the processing to the user device, Flash Redirection helps reduce server and network load, resulting in greater scalability while ensuring a high definition user experience. 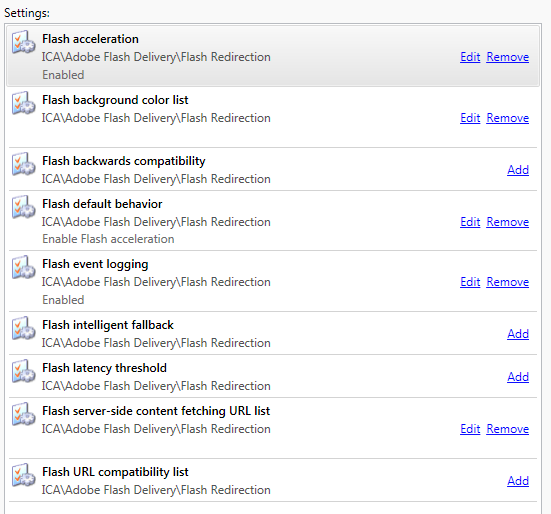 There are two types of Adobe Flash Players are required to use Flash Redirection. One type is used with Windows Internet Explorer and is identified by Adobe as Flash Player for Windows Internet Explorer . This player is sometimes referred to as an ActiveX player. The second type is used with non-Internet Explorer browsers and is identified by Adobe as Flash Player for Windows – Other Browsers . This player is sometimes referred to as an NPAPI (Netscape Plugin Application Programming Interface) Flash Player. The second generation and legacy versions of Flash Redirection are complete and run in separate virtual channels. Intelligent Fallback, which allows Flash sessions, on a per-instance basis, to be determined to be more efficient when rendered on the server. The Flash URL Compatibility List replaces the original Flash URL Blacklist setting. Listed URLs can now be blocked or specified for rendering on the user device or the server. How do you know if this works…? simple, check your Windows Task Manager and see if the PseudoContainer2.exe process is active when viewing Flash content. If it is not running, then you are not offloading flash to the local device. 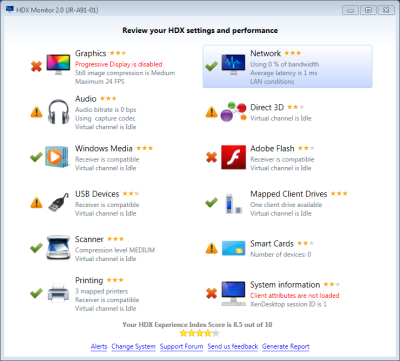 Download the HDX Monitor 2.0 tool from http://hdx.citrix.com/hdx-monitor/tech-preview. This will help you validate the operation and configuration of key features of XenDesktop’s and XenApp’s HDX stack. When you have a session open on a server, you can gather further detail on the HDX operation. When you click on the Adobe Flash icon, you will notice that Internet Explorer 9 is not supported, and you will be redirected to install an HDX MediaStream Hotfix from http://support.citrix.com/article/CTX134426. After this is installed, and you view a session in the HDX Monitor 2.0 tool, you will now see that it is supported. But it still does not work. Install HDX MediaStream Hotfix (Version 5) HDXFlash200WX64005 – I had to call Citrix Support as this is not a public release as of today. Create the following registry keys – I suggest you do this as a GPO or inject them on your mandatory profile if you use one. Once you have these settings are setup, go to YouTube or any flash based web site, and Receiver will prompt you if you want to optimize the content 🙂 – That is a good sign. Open the HDX Monitoring tool and you will now notice that both IE 9 is supported and Flash Redirection is Active :)… In addition, check your Windows Task Manager and look for the PseudoContainer2.exe process. Daniel thank you so much for the post. I been going nuts over this and your suggestion worked! Can not thank you enough for taking the time to write these awesome articles.